Precompetition physical preparation will be wasted unless the coach also helps the athlete design effective precompetition mental and emotional preparation strategies. Athletes are known for finding creative ways to lower their stress before a competition. The first consideration in creating an effective evaluation plan is to identify the right things to evaluate. At minimum all program evaluation systems should include tools for measuring athlete development. Presents the best coaching methods and practices for each season on the sport calendar – pre-season, in-season, post-season, and off-season - and offers specific actions, tools, and guidelines for coaches to create a cycle of continuous improvement for themselves, their athletes, and their teams. If you are a member of the HK Rewards Program, when buying a new print edition of this book, you will be granted the option for downloading the e-book edition at no additional charge. Learn more. Maximize the development of your athletes and team throughout the year, and just maybe win a postseason title in the process. Coaching Better Every Season: A Year-Round System for Athlete Development and Program Success presents a blueprint for such success, detailing proven coaching methods and practices in preseason, in-season, postseason, and off-season. The Coach Doc, Dr. Wade Gilbert, shares his research-supported doses of advice that have helped coaches around the globe troubleshoot their ailing programs into title contenders. His field-tested yet innovative prescriptions and protocols for a more professional approach to coaching are sure to produce positive results both in competitive outcomes and in the enjoyment of the experience for athletes and coaches. Coaching Better Every Season applies to all sports and guides coaches through the critical components of continual improvement while progressing from one season to the next in the annual coaching cycle. It also presents many practical exercises and evaluation tools that coaches can apply to athletes and teams at all levels of competition. This text is sure to make every year of coaching a more rewarding, if not a trophy-winning, experience. The primary audiences for Coaching Better Every Season: A Year-Round System for Athlete Development and Program Success are coaches at the high school, club, college, and Olympic levels. Secondary audiences include serious youth sport coaches; students in college and university coaching courses; and sport administrators at the high school, collegiate, and Olympic levels. Wade Gilbert, PhD, is an award-winning professor in the department of kinesiology at California State University at Fresno. Dr. Gilbert holds degrees in physical education, human kinetics, and education and has taught and studied coaching at the University of Ottawa (Canada), UCLA, and Fresno State. He has more than 20 years of experience in conducting applied research with coaches around the world spanning all competitive levels, from youth leagues to the FIFA World Cup and the Olympic Games. He is widely published and is frequently invited to speak at national and international events. Gilbert is a coach education advisor to USA Football and a regular contributor to coaching seminars for Olympic and national team coaches in the United States and Canada. In addition, Gilbert is editor in chief of the International Sport Coaching Journal, published by Human Kinetics in conjunction with SHAPE America and the International Council for Coaching Excellence (ICCE). As Human Kinetics’ coach education advisor, “The Coach Doc” writes articles and conducts webinars on a variety of coaching issues. Gilbert lives in Clovis, California. “Dr. Gilbert’s research on coaching is the best coaching science we’ve got. He has studied, learned from, and collaborated with successful coaches around the world, including national, Olympic, and world championship coaches—and John Wooden himself. I highly recommend the book, which most certainly will have you Coaching Better Every Season." "Working with Wade and applying the strategies he shares in Coaching Better Every Season has helped me set the vision and standards for our wrestling program." 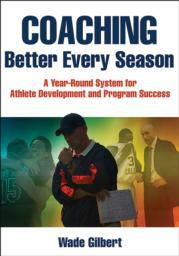 "Coaching Better Every Season should be a mandatory read for all coaches. It presents the art and science of coaching, no matter the sport." All ancillary materials for this text are FREE to course adopters and available online at www.HumanKinetics.com/CoachingBetterEverySeason1E. Create your own tests and quizzes. Choose from more than 300 multiple-choice test questions. Provides a blueprint for leading in-class discussions and structured activities surrounding coaching concepts and situations highlighted in the text. Offers a library of learning activities to incorporate into your instruction. Includes 150 printable forms, self-assessments, checklists, and evaluations to use in class or as outside assignments. The complete PowerPoint presentation features over 340 full-color slides that highlight the most important concepts and select figures and tables from the book. The image bank includes most of the figures and tables from the text, sorted by chapter. Images can be used to develop a customized presentation based on specific course requirements. A blank PowerPoint template is provided so instructors can quickly insert images from the image bank to create their own presentations. Easy-to-follow instructions are included.